Easiest Healthy 3 Ingredient Protein Pancakes! I LOVE having pancakes for breakfast, and ever since I found this healthy alternative to the sugar-filled ones, I have never looked back. I’ve seen a lot of different variations of these online and to be honest, at the end of the day I think it comes down to personal preferences and what kind of flavours you like. These pancakes are perfect if you are following a grain-free or dairy-free (just replace the whey protein with a plant based one or simply use coconut flour instead) diet and they’re also gluten free, so it’s really a win all round. I especially love having these post-workout to refuel my body and set me up for the day. The recipe below is so easy and foolproof, you can then spice it up by adding your own favourite toppings. It’s simply a batter of banana, egg white and protein powder(whichever protein powder you prefer will work on this one. I use the PhD diet whey in vanilla flavour). You might need a splash of almond milk if your batter is not wet enough, although I’ve never really had this problem. I’m not a big fan of maple syrup as I feel that just takes away from what we’re trying to achieve here….cut down on the sugar. Anyway, the bananas add so much sweetness, you won’t even need syrup, but If you like syrup slathered on your pancakes then I highly recommend rice malt syrup. I personally like to top mine with fruit, sometimes I’ll blend some into a purée so get that nice moist texture to replace the syrup. I also love topping with natural or coconut yoghurt, omg so good! 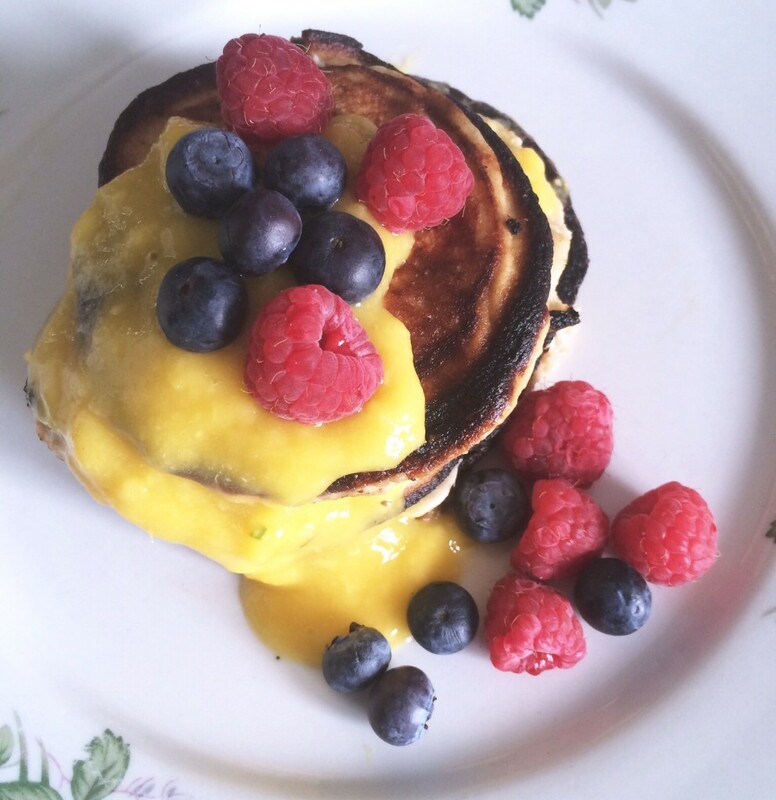 On this occasion I stacked them with slices of banana in between, then made a mango purée by dimpling blitzing some fresh mango in my blender, then drizzled it all over, topped with some berries and voila! Party in my mouth? 2. Place the banana, egg whites and protein powder into blender and whizz until it’s a smooth purée consistency. It should be thick but pourable, if it seems a bit thin then add a little more protein powder. 3. Brush pan lightly with the coconut oil, then pour in a circle of batter slowly, shake the pan gently to spread the batter into a 3 inch circle. 4. Cook for 3-5 minutes on one side until you see bubbles riding to the surface of your pancakes. 5. Using a spatula, carefully lift the edge and take a peek. If the underside of your pancake is golden brown, it’s ready to flip. Carefully flip your pancake and cook for another 3 minutes on the other side until both sides are golden brown and the pancake is cooked through. If the bottoms turn dark, lower the heat a little. 6. Serve with preferred toppings. Previous Post My Scary Stalker, Part Two! Next Post Throwback Thursday And Lessons In Self Love! Now that looks like a fantastic start to the day! Am going to try and make this recipe at the weekend! My husband is avoiding grains at the moment, so this is a great way for him to prepare a quick and healthy breakfast! Thanks for the inspiration!